Think spring-blooming bulb plants, and tulips (Tulipa), daffodils (Narcissus), and Crocus leap to mind, but a wonderful avenue for northern gardeners to explore is the many other readily available but under-used bulb plants that heartily grace the spring garden. I love Fritillaria, a small, classy plant that provides some of the earliest bloom to my garden. It thrives in my Zone 4 beds, and does fine in Zones 2 and 3 if planted twice as deep as instructed and mulched for the winter. The flowers hang downward (“pendant”) in white, and purple-and-white checkerboards. 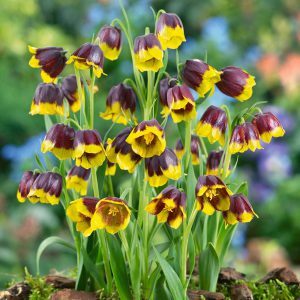 The added benefit to Fritillaria is that it does well in shade, and tolerates damp spots, a condition usually spelling death-by-rot for bulbs. Plant in the fall in drifts of no less than seven bulbs (but up to dozens), scattered in groupings throughout the very front of the bed.